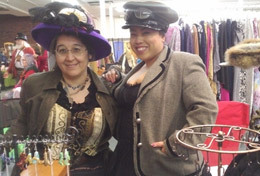 At Hats and Spats, we have found a way to combine our love of creating with our love for steampunk. We bring our different skills together to create beautiful, whimsical, and wearable tokens from our favorite niche of UN-history. SPRING 2018 - Say goodbye to snow, say hello to sunshine! Come see Hats and Spats at local craft and steampunk fairs around Maryland! Details in calendar below. Hats and Spats on social media. © All materials copyright 2016-2019 Hats and Spats. All rights reserved.